Whether you’re a clean-as-you-go type of person, or someone who has a big clean on the weekend, most people will spend at least five hours a week cleaning the home. Yet many of us still feel that even after all that, there are areas we have left untouched collecting dirt that only becomes harder to clean. And don’t we all wish we had a little bit more time to spend on ourselves instead of doing the chores? That’s why, with the help of AO.com, we have put together a handy list of ways you can use a dishwasher to cut the time you spend cleaning everyday items, and also those things you wish you didn’t overlook. From bathroom hacks to washing fruit and veg, here are seven ways your dishwasher could be saving you precious time that may otherwise be spent with a sponge in hand. Toys are a breeding ground for germs and young children in particular have no qualms about putting these bacteria-ridden toys in their mouths. When soap and water just won’t do, a quick spin in your dishwasher will kill bugs on plastic toys. Some baby toys are labelled dishwasher safe, but if in doubt wash on the lowest temperature setting. And – if it wasn’t obvious – don’t put battery operated toys in the dishwasher. The dishwasher will save on drying time too, so hopefully tantrums can be avoided with their favourite toy out of action for less time than handwashing would require. Remember to tether smaller toys in the utensil tray or rack to avoid losing them. One day, someone will invent a self-filling and self-unpacking dishwasher. Until then there is the new Beko AutoDose Dishwasher that saves you time by holding up to a month’s worth of gel detergent. It then decants the perfect amount of gel or liquid for your wash every time, meaning you can just stack it, turn it on and go about your day. What’s more, it is Wi-Fi connected meaning you can use it with Beko’s own HomeWhiz app from your smartphone and control it from wherever you are. And, if that isn’t enough, it comes with six months of Finish Gel detergent if you order it from AO.com before 28th August 2019. So, not only will you save time spent refilling it, but you can be assured you won’t run out of detergent for the next few months at least. And, using the HomeWhiz app on your compatible smartphone, you can even set up automatic re-ordering so that your dishwasher senses when it is running low, triggering the app to buy more online to be delivered before the reservoir is even empty. If you are guilty of never cleaning your makeup tools and hairbrushes, this dishwasher hack could save not only time, but save you from the risk of breakouts from using dirty sponges. In an ideal world we would wash our makeup sponges after every use as they come into close contact with our skin. But when this isn’t possible they should at least be done once a week. Whack them in the dishwasher and the job is done for you. The same goes for hairbrushes and combs. Just avoid using the dishwasher on brushes with natural bristles, or those fixed with glue – the high temperatures could unset the glue and the bristles will fall out. Cleaning takes so much longer when the things you are using to clean are full of grime too. Save time and money by putting sponges, scrubbing brushes and even your vacuum cleaner tools in the dishwasher. No more chucking sponges away before their time is up, and you can even clean your vacuum filter in there too – just use a cooler, gentler cycle to avoid damage. Obviously, the bath, shower and loo won’t fit in there, but your shower head, toothbrush holder and soap tray may be dishwasher safe. These can become coated with soap scum and limescale which can take ages to scrub off. A quick spin in the dishwasher and they are good as new. And while that is happening you can turn your attention to the floors, sink and shower screen. Nobody likes cleaning the oven. Burnt-on food is notoriously hard to clean off but with the help of your dishwasher you could prevent what would otherwise be an hour-long job. To start, find a large plastic bag and put the oven shelves inside. Spray them with vinegar while inside the bag (it might be easiest to do this over the bath or with them on a large work surface) then sprinkle in some baking powder. This will start to fizz and help shift baked-on dirt. Leave for half an hour, then put them in the dishwasher to rinse clean. You can put hob pan supports and hob burner caps in the dishwasher too, meaning you can clean your whole cooker in no time. This is an unusual one and only recommended if you have a large quantity of fresh produce to wash. Don’t put any detergent in, switch your dishwasher to cold and pack vegetables close together to reduce movement and prevent bruising. This is a great tip if you have lots of potatoes or root veg to clean as they are hardier – just brush off as much soil as possible beforehand to prevent damage to your machine. Ready to speed up your spring clean? With Beko’s new hassle-free AutoDose function, you can fill your machine with a month’s worth of gel detergent and let the machine do the rest. As it decants the perfect amount each time by cleverly sensing how dirty your dishes are, not only will you not have to refill for up to a month, but it is great if you tend to be a bit liberal with the washing liquid. And, for an even more hands-off smart approach, as Beko have created Europe’s first connected dishwasher, you can control it from wherever you are with your smartphone or tablet via the unique HomeWhiz app. Or control with your voice using your Amazon Alexa – you can tell it to wash your dishes while you kick back and relax (or more likely get on with the 101 other things you have to do…). 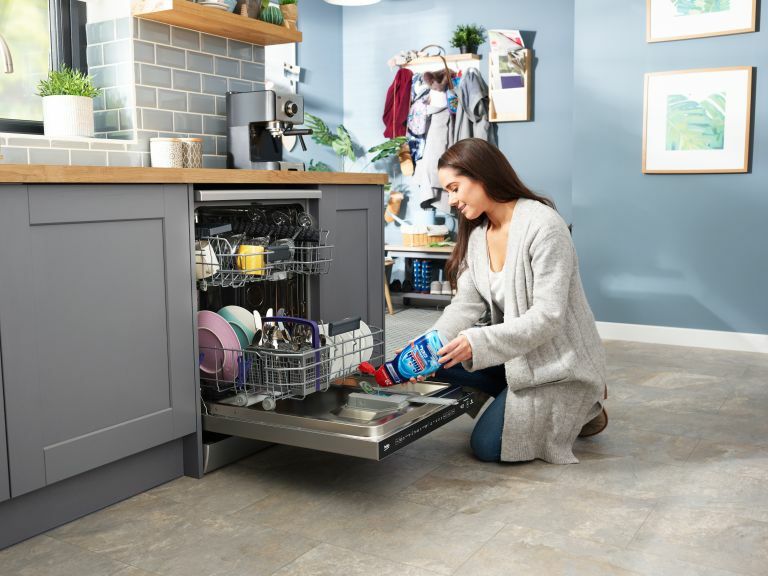 Purchase either the Beko DEN59420DA Freestanding Autodose Dishwasher or the Fully Integrated AutoDose model DIN59420D before 28th August at AO.com and get a free six-month supply of Finish Gel dishwasher detergent.